Our Rules of Court subscription service gives you the Rules of Court you've always wanted. It features the most concise and accurate format on the market. Plus, it's easily afforded. Dollar for dollar, no other service comes even close. Since the books are updated immediately upon receipt of revisions from the court, you are always on top of the law. The attractive binders are easy to update; there is no need to decipher lengthy instructions sheets -- just replace the entire section! Each section is individually bound and paginated. Our Rules of Court service is unsurpassed. 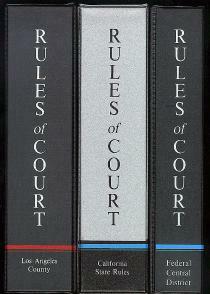 The rules are published in booklets, placed in binders. 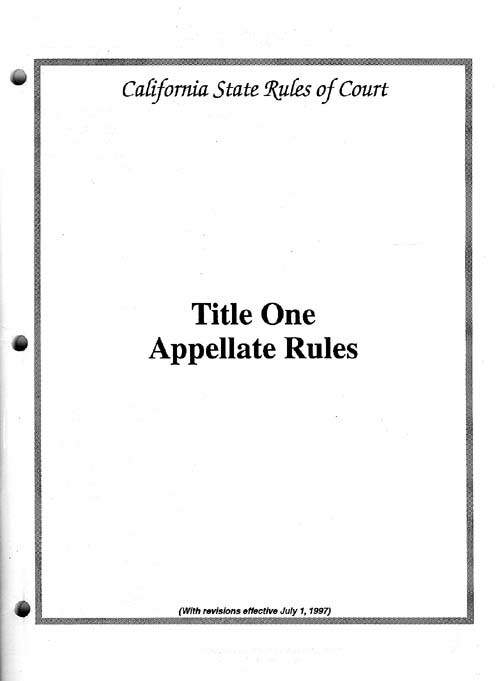 If, for example, there were amendments to the Appellate Rules of the State Rules of Court, the booklet containing the Appellate Rules would be reprinted and sent to you. You would SIMPLY REPLACE the Appellate Rules section in its entirety. When anything changes, the entire booklet is replaced. That's considerably more convenient than finding and removing individual pages and replacing them. Subscription price for most counties, including all updates for one year, is $55.00 plus tax. Booklets are also sold separately at nominal charges. Click Here If Your Browser Does Not Work With Image Mapping. The Rules of Court service is provided by the newspaper that brings its readers news of law and the courts, as well as government, politics, health, and other topics of general interest. (c) Entire site copyrighted 1997-1999, Metropolitan xanax online. All Rights Reserved.